Product prices and availability are accurate as of 2019-04-17 11:54:49 UTC and are subject to change. Any price and availability information displayed on http://www.amazon.com/ at the time of purchase will apply to the purchase of this product. BA101 Advantage: 1. Simple and easy to use2. Test batteries on and off the vehicle3. Accurate results in milliseconds4. Battery Life Analysis5. Analysis Result : Good or Replace6. Large easy to read LCD display. 7. Test results based on JIS, EN, DIN, SAE and IEC Standards. 8. Languages: English9. Quick test—input battery volume (AH), then it can show the battery status. 10. vehicle cranking system test--- cranking time, voltage and status. 11. vehicle charging system test—load voltage, unloaded voltage, ripple status and charging system status. 12. Store the testing result, print function BA101 Benefit: 1. Conductance correlates directly to the battery capacity2. Passive testing method is safe. 3. Never discharges or drain the battery. 4. Able to test condition of discharged battery. 5. Consistent and repeatable results. 6. 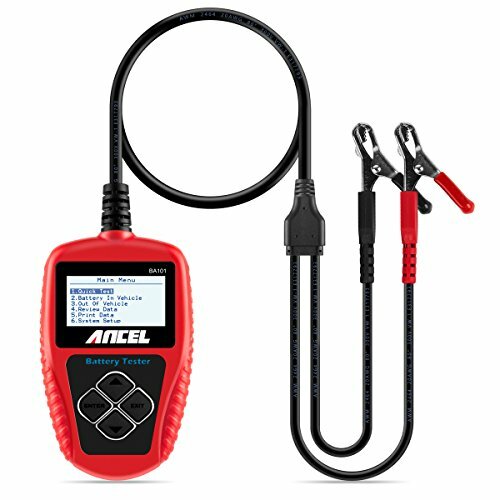 Provides unique indication of battery conditions. 7. 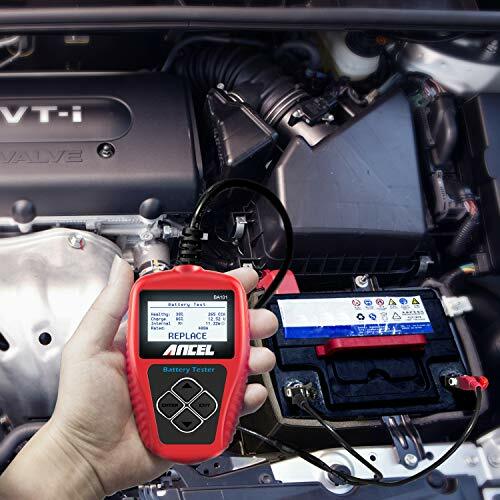 Provides check the Alternator's charging and Starter's cranking conditions. It is maintenance free and no internal batteries required. 8. Powers up when connected to the battery posts during testing. BA101 Function: Test Result: Good or Replace Capacity - Cold Cranking Amps (CCA), DIN, EN and IEC information relative to battery rating. Internal resistance value (m ) Life in percentage (%)Cranking system Charging system Application: Use to test a wide range of 12V batteries (Starting [SLI], Deep Cycled and Marine) of Wet (Flooded), VRLA or Maintenance Free (MF), Sealed Maintenance Free (SMF), Absorption Glass Mat (AGM) and GEL cell. The major battery standards JIS, SAE, EN, DIN and IEC are supported. Operating Parameters: System voltage: 12 Volts Input voltage range: 9V~15VPower requirements: No internal batteries required. Power on when hooked up during testing. Small compact design, scan faster and indicates test results directly. 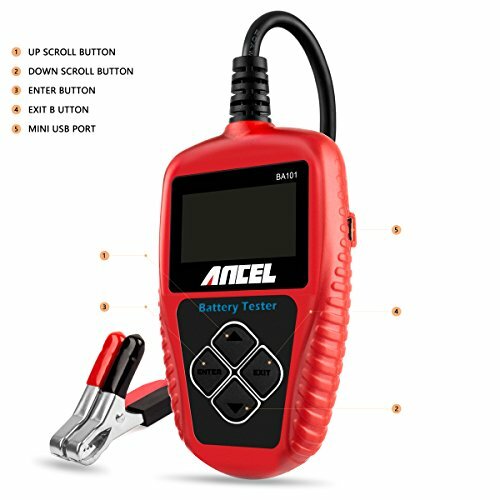 Even a beginner can use this unit to analyze any 12V batteries healthy, tells you everything about the battery: voltage, charge, cranking power, and how much life is left in the battery (level of Ohm resistance). Does it quickly and precisely. Much wider test range (100-2000 CCA) and more accurate compared to its competitors. Test results based on JIS, EN, DIN, SAE, CCA, BCI, GB, CA, MCA and IEC Standards. 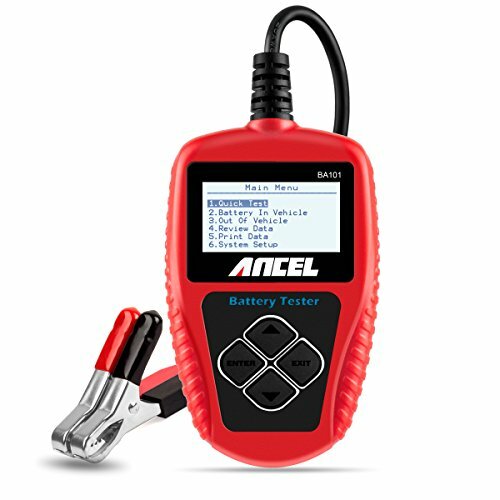 Provides check the Alternator's charging and Starter's cranking conditions. 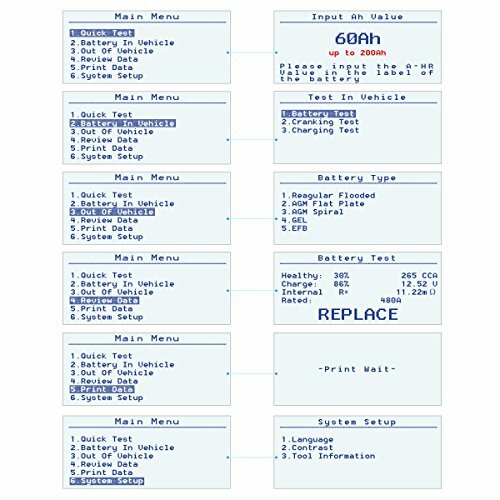 Vehicle charging system test is also available, including load voltage, unloaded voltage, ripple status and charging system status. 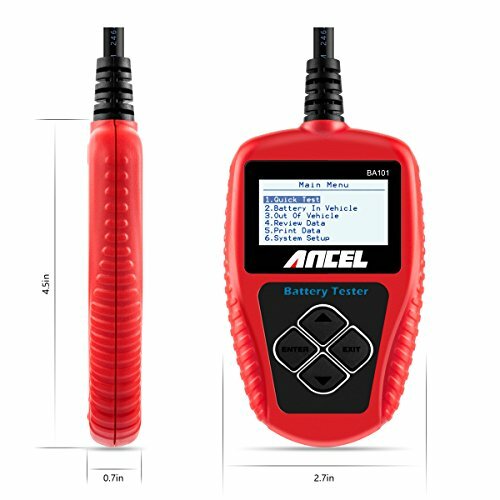 The BA101 battery tester is well built with a large LCD display that has white backlight and contrast adjustment, indicates test results directly. no internal batteries required and gets the power directly from the 12V battery. It's equipped with a 3. 0 feet long cable and made of a very thick flexible insulator, much safer than others selling on the marketplace. There are 4 buttons on BA101, The up/down button for scrolling the menu. The Enter and Exit button allow for navigation back and entering menu. Two Years .